The history of each school site will be different but the shape of any particular history will probably be much the same. The Founding of the School. Why it was founded and how it has developed over the years. Any schools which have occupied the building before. Founding the School and Finding the Site. Why the school was needed ? Population movement and, for example, the expansion of London at the time. 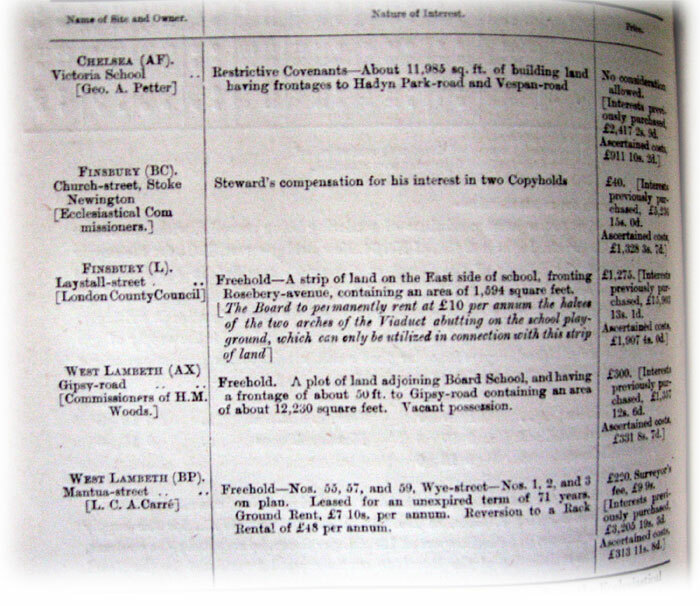 The history of the School Site. What was there before the school was built. This requires a set of very local maps of the school neighbourhood over the years. A computer screen is ideal for displaying these. Using the School Building as a Teaching Resource. The date and architecture of the building: the materials of the building: why and how these were used at this time. The history of the streets round the school and some Walks to examine the buildings, their dates, styles, materials and where they fit into the sequence of London buildings. When the Compulsory Education for all for all children became law in 1870, the London School Board was set up to build and run schools. They sent inspectors round each district to find sites within walking distance of the local pupils. Sometimes the sites were easy to find. Often it was quite difficult, especially in the crowded centre, where land prices were high. Some of this history can be found in the Minutes of The London School Board, the London County Council, the Greater London Council (ILEA) and, after the ILEA was abolished, the minutes of the Local Boroughs. Areas outside London will have their own records of course. London records are housed at London Metropolitan Archive, 40 Nottingham Road, EC1, 0207 495 7400, near Sadler’s Wells. The minutes are in large bound volumes, which are on open access: one does not have to order the volumes, or wait for them to be delivered. It is easy to follow the story of the planning, building and opening of a school, by moving quickly from one year to the next and photographing the relevant pieces. Below are some typical entries. These scraps of information build up to a coherent story which can be obtained in no other way. Many school buildings have been used to house other schools of different types over the years. Secondary schools, Evening Institutes, Specialist schools of different sorts, may all have used the same bricks and mortar. Haverstock Road School, Chalk Farm, housed no fewer then ten different schools over the years and has just built another. These histories too can be found in the minutes. Any Primary school housed in an old London School Board three-decker school, is certain to have a mixed history. 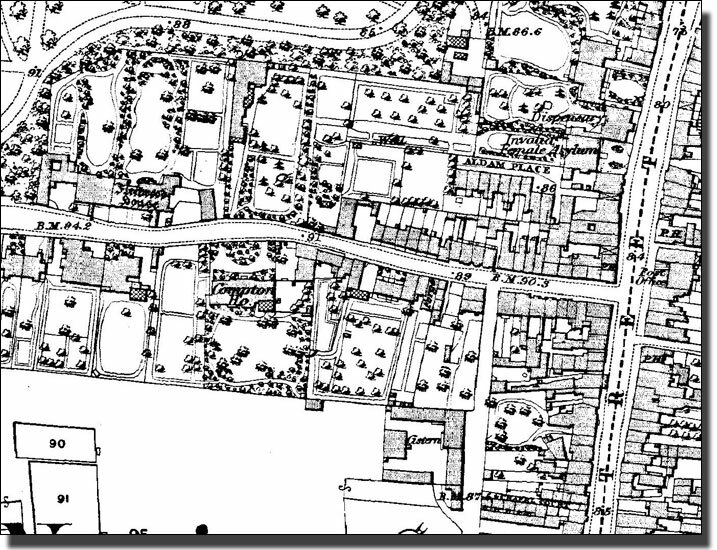 The History of the Site: A Sequence of Maps. Each school needs a sequence of maps with the individual school in the centre. These could cover perhaps half a mile square in towns and more in the country. A young child is familiar with only a very small area of land and these maps would be the stamping ground of the pupils in one particular school. To others they would be foreign territory. Each map should have a link to a larger map of the same area and back again to the sequence. Ephemera left by earlier occupiers of the building. Local histories written and printed by earlier pupils can be helpful, not only in suggesting updated and revised versions, but also for a discussion of earlier forms of printing with moveable type and ink rollers. Work which is easy today was once much more laborious. The history of color printing in particular, is fascinating, and ephemera can be a way in to discussion of this. Local newspaper articles about the school and/or former pupils can be invaluable. Eliza Armstrong and Lisson Grove, Pygmalion, and the Age of Consent is a classic. Growth of St. Marylebone and Paddington, p. 117-8, by Jack Whitehead. Oral History, collected by pupils is an obvious source, but may need careful checking. Urban myths are rife, and often far more beguiling than the truth. If your school building is very old it may perhaps have a history which starts like this. In 1870 the Compulsory Education Act was passed. This commanded that all children must attend school. Many children in Stoke Newington went to school but some of the schools were not very good and some children did not attend at all. Some went to school occasionally but often stayed away to look after younger children or to work. Now every child had to attend school every day and a new building was needed. The London School Board had a mammoth task in finding sites and building. The greatest need was in the centre of London so it was not until about 1890 that they could think about building in Stoke Newington. This in now the William Patten Primary School Site. They were going to build a Three-decker School. There would be Infants and Juniors on the ground floor, Senior Girls on the First Floor and Senior Boys at the Top. Three layers of children and they would all have to walk to school and back four times a day. The children had to go home for a mid-day meal, for there were no school dinners. The older children could have walked to a school further away, but the Infants could not have done so. Children were clustered around Stoke Newington Church Street and the High Street so the Board had to find a site within easy walking distance. 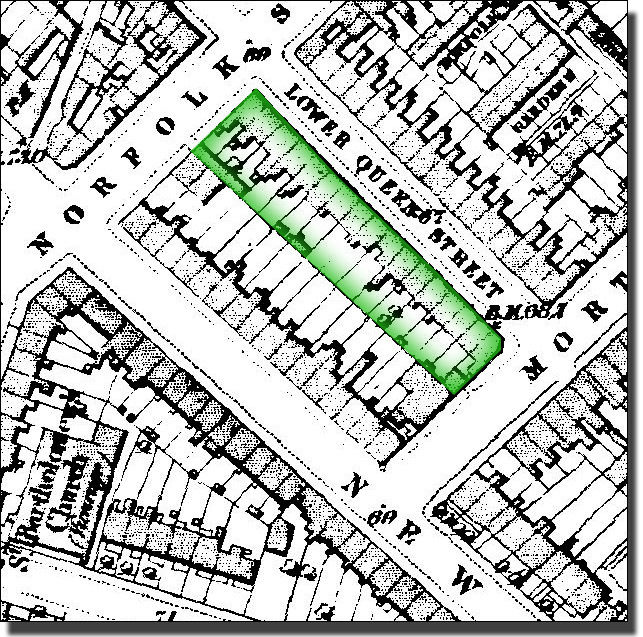 The 1848 Tithe Map of Stoke Newington Church Street. 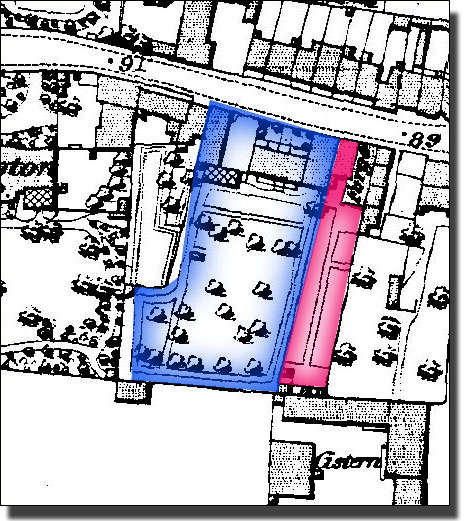 The future site of William Patten Junior School was probably the two copyholds numbered 519 & 520. 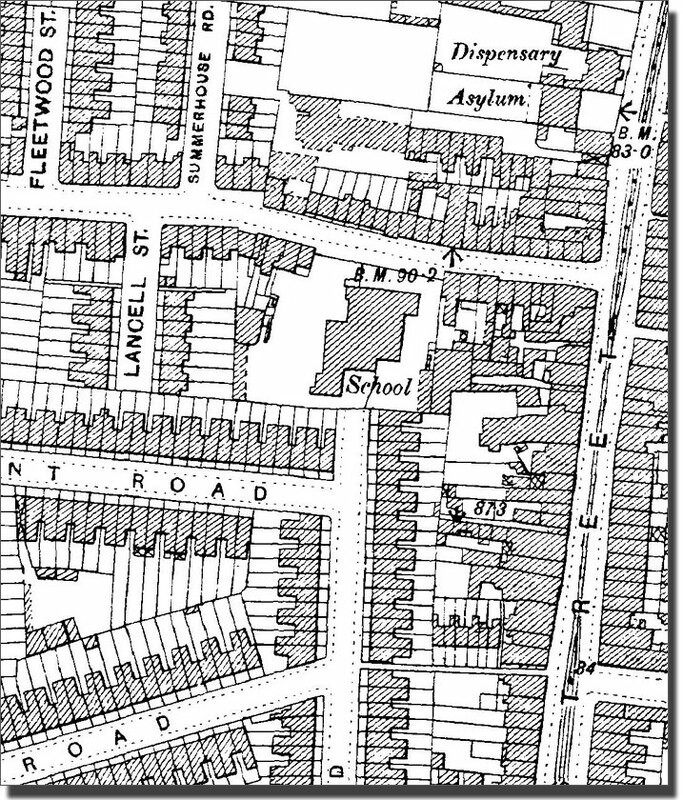 The same bend in the Stoke Newington Church Street still exists by the school gate. This is an invaluable map as it shows every property and the house sites. Houses line both the High Street and Stoke Newington Church Street, but the ground behind is still fields. The two copyholds which became the school site were between the figures 91 and 89. These are spot heights on road and have nothing to do with the school of course. The two houses and gardens which became the school site. The sites had houses at the street end and long gardens. The larger one had lots of trees, probably fruit trees and a greenhouse (crossed in). The houses were held as copyholds,which means that the owners’ names were copied into the Manor Rolls as proof of ownership. This was a very old form of tenancy. Most copyholds were held for three lives. When three generations had all died, the property reverted to the Manor. This could be a very long time, but in some tragic periods, like plague, could be very short. Thomas Hardy’s novels are full of copyholds and the tragedies which arose. Church Street School had been built in 1892, so this is the first map showing the new school building. Today the site has extended into Lancell but the school building has the same footprint. The History of Islington Green School. Similar school sites could be found at intervals right up to today and Google Aerial Map. ++ The search for a school site. 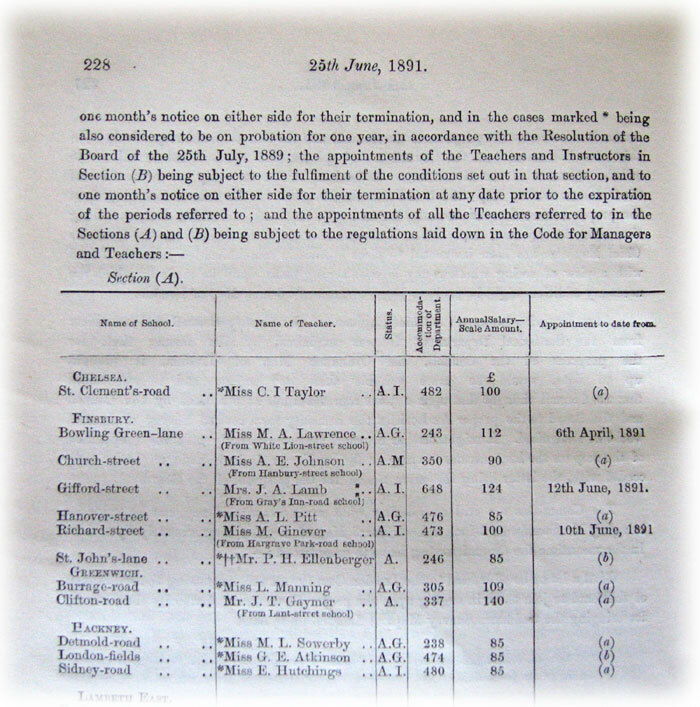 Minutes of the London School Board, December 1883 - May 1884 now held at the Greater London History Library. Purchase of interest of Ciothworkers’ Clothworkers’ Co. Page 345 para 19. ‘The Committee recommended that the purchase of the following interest in Sites on the undermentioned terms. Several other sites for different schools in other parts of London follow. They do not concern us here, but indicate how many schools were in the pipeline and how actively the Board was building. 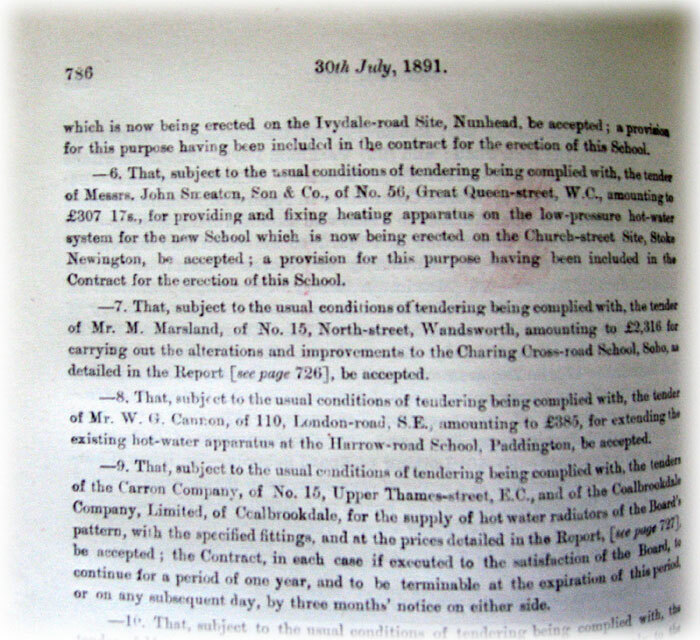 ‘That a reply be forwarded to the Education Department informing them that the Board are arranging for the purchase of a Site in Queen’s Head-street, and that, so soon as a contract for the purchase shall havebeen signed, the alternative sites proposed to be scheduled in Colebrook-row and St James- street (Finsbury AJ and AK) will be abandoned. I have today inspected the Sites in Colebrook-row and St James’-street, and the site last submitted in Queen’s Head-street, I have also conferred with Dr Matthews, the first signatory of the memorial against the adoption of the Site in Colebrook-row. Apart from the other considerations of the three sites submitted, I am in favour of the Queen’s Head-street site as being the best Site of the three, when the considerations that are not unfairly urged in the Memorial are taken into account, this preference in favour of the Queen’s Head-street site is confirmed. Not only is the Site more accessible to the class of children for whom a the new School is needed, but also its central position between Angler’s Gardens and Hanover Street Board Schools admirably fit it for the purpose’. The Inspector’s phrase. ‘when the considerations that are not unfairly urged’, suggests that there had been some special pleading. No doubt particular estate agents, or other interested parties, had pressed their claims rather too strongly, but the decision was clear. Queen’s Head Street was thought to be the best site. 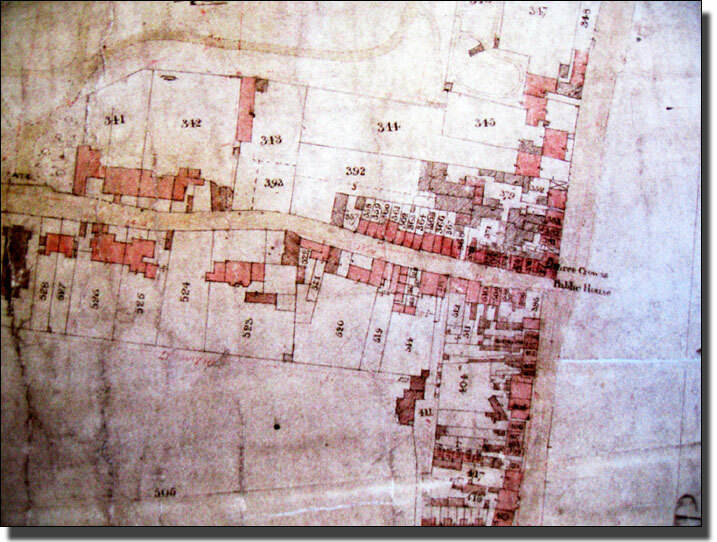 The tracing of the 1870 Ordnance Survey map shows the row of houses bought by the London School Board. It would be interesting to know the condition of the houses which were to be demolished and what happened to the tenants. There was no security of tenure: they would have had to crowd in elsewhere, as hundreds of others were doing at this period. The City of London was being torn apart to build new roads, new sewers, new bridges. As a result it was a time of intense migration from the centre of London. Clearing this score of houses would just have added to the movement. Perhaps someone else will analyse the 1871 Census and find the sorts of people who lived on the site, how many there were, where they had come from, their ages and how they earned their living. bought from the Clothworkers’ Company shaded in. This was the site of Queen’s Heed Street School. The close study of school buildings can be an easy way to encourage pupils to look at building materials, to start geological studies, the history of building construction at different periods, the history of canals railways and roads and how these affected the materials available to architects at different periods and their effects on building styles. The present disk contains a large amount of material on these subjects, tested over the years, which can be used to help study any other school building. In the same way, local houses can be studied, dated, explained, often from the playground without the bother of getting parental consent to leave the school building. Economics too come into it. When the London School Board was set up, in 1870, they priced the buildings and then ADDED TEN PER CENT so that the architects could afford to ‘make the building architecturally interesting’. During the austere period soon after the Second World War, Woodberry Down Comprehensive School, which later became one half of Stoke Newington School, took two ten per cent cuts during the course of construction. Another, in the Thames Estuary, was given a flat roof covered only with a sheet of thick polythene, which was quickly destroyed by seagulls. Each school building was built at a particular time and the design will reflect it.